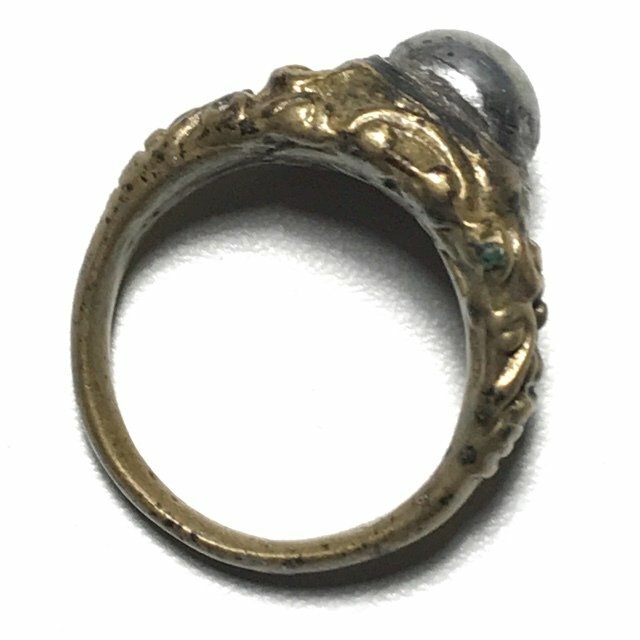 A very rare and exquisitely fashioned cast sacred brass ring, and a pristinely preserved example of the Hwaen Maekapat Alchemical Kaya Siddhi Ring of Protection and Wealth, from Luang Por Im, of Wat Hua Khao, measuring 2.0 Cm Inner Diameter. Luang Por Im was an olden days Guru Master, born over 150 Years ago, in 2406 BE, and who passed away more than 70 years ago in 2480 BE. Forged using ancient alchemical formulas of metallurgy and empowered with the incantations of the ancient sorcery grimoires of the lineage of Luang Por Im, the Hwaen Hua Maekapat is a famously powerful ancient amulet of high repute. The ring was made sometime around 2460 BE. The Hwaen Hua Maekapat Alchemical Substance ring is very old and rare, and is famous for its protective power against Dangers, Black Magic and Maha Pokasap to attract and retain wealth and treasures. This ring is a 'Niyom' class preferred amulet, of the finest artisanship. Luang Phu Im made various models of magic rings, some of them of simple design, with thinner metal, and others with finely designed decorative designs in heavier cast metal. This ring is one of the rarer and highly decorative exhibits. and is recommendable for the devotee with lower budget, who seeks the Magical Power, but also seeks a perfectly pristine example for competition entry. A very rare and highly preferred magic alchemical metal ring using the Wicha of the Ancient Alchemists, to smelt and forge the Sacred Maekapat Kaya Siddhi Substance, using a combination of metallurgy, and alchemy, and the power of incantation. A powerful protective amulet with wealth incrteasing powers from Olden Days Miracle Monk, Luang Por Im, of Wat Hua Khao. The Hwaen Hua Maekapat is forged from a highly sacred and powerful admixure of alchemical metals and ancient artifacts. The ring itself is formed from brazen alchemical metals with a certain quantity of brass, bronze, gold and silver, and has a bead of Maekapat Kaya Siddhi Elemental Substance forged into the head of the ring. Nuea Maekapat, is one of two similar Ancient Alchemical Alloys used for Sorcery, the other being 'Nuea Maekasit'. Nuea Maekasit and Maekapat obtained by Alchemically smelting Iron Artifacts, with Lek Lai and Mercury as the main base Magical ingredient. The substance is empowered by performing Elemental Invocations until the structure of the metal changes, and becomes a sacred Metal of Alchemical Nature. Alchemy and Metallurgy are combined here as one facet of the various aspects of empowerment of the amulet. It has the reputation of being able to 'Hnun Duang Chadtaa' (improve Karma and Horoscope, Luck, Fortune, Destiny and Fate). It is also reputed to be able to forewarn of Dangers or Enemies. As a sacred metal for the Creation of Sacred Rings and other Amulets, the Nuea Maekasit and Maekapat are one of the most Apt and Effective material to use for powerful effects. Luang Por Im of Wat Hua Khao, was amn extremely powerful sorceror monk of olden days, whose miracles are legendary to this day. The miracle of the Sala Yai large Dhamma Salon Building was a very well known legend, which tells of the old Sala, being visited by a group of elephant herders with 5 elephants. The herders came and parked their herd next to the Sala, which at that time had only small wooden pillars holding up a grass-hut style roof. The temple orphans saw the herders and approached to see the elephants. But they then saw something very strange happening; The herders were placing ice on the floor, and perched a cooking pot over the ice, and began to boil rice over it! The temple orphans ran to the Kuti of Luang Por Im, and told him about this strange sight. Luang Por Im then told them that the herders were from Surin, and had powerful sorcery, and had conjured up an ilusion to hide the fact that they were usiing one of the wooden pillars of the Sala building to buirn and cook their rice. he then asked the temple orphans to go and bring him a coconut shell. He took the shell, and used it to sweep the floor of his Kuti with, and then told the orphans to go and check back at the Sala, to see what had happened. Ta Hnid was known to have only one testicle, which is believed to bring Kong Grapan Chadtri Invincibility against blades and projectiles. Ta Pan was the nephew of Luang Por Im. The two enemies met behind the Uposatha Shrineroom of the temple at Wat Hua Khao, and using sharp swords, began to fight. They stabbed and cut at each other without restraint, but no matter how many times they hit the mark with each other, nobody was hurt or cut, by a single blow! In the end they became so tired, and still unable to harm each other, that they gave up, and sat down together in truce, and drank some water.They talked and concluded that each of them must have something special protecting them. Ta Hnid admitted he has only one testicle and was empowered by nature with Kong Grapan Chadtri. He asked Ta Pan what his secret was, and Ta Pan said that the only thing he had on him was the single Takrut he had received from his Uncle Luang Por Im. The two became friends forever, and close devotees of Luang Por Im, and the Takrut of Luang Por Im became a legend thereafter. Luang Por Im once had a Looksit (Devotee), who liked to play in Siamese Fighting Fish Competitions, but who had never won a single competition. He complained about this to Luang Por Im, who told the devotee to go and bring him some Bai Jag Papyrus leaves. The devotee came back with some papyrus leaves for Luang Por Im, who took them, and folded them into the form of a Siamese Fightiing Fish. Luang Por Im gave the bottle to the devotee and told him to take it to competition, which he did. He won the competition, and took his winnings and the fish home with him. When he got home, he decided to place the fish in a different bottle, and took it out with a net. But as soon as the fish rose above water, it turned back int a folded Bai Jag leaf origami fish. This was yet another amazing miracle of Luang Por Im.There was another story of the time that Luang Por Im came into the monks refectory and told them to hurry up and finish eating their alms, because they were needed to help to bring water to douse out a house fire. The monks asked Luang Por Im what was going on? Luang Por Im told them then, that the night before, some local villagers had broken into the temple grounds to steal fish from the ponds, and that because of this, their houses were going to set on fire today. The monks then ate their food quickly wondering what Luang Por Im was talking about, and as they left the refectory, were surprised to hear a sudden arousal of people shouting 'Fire, Fire', and the monks realised that Luang Por Im had foreseen the event with his psychic powers. Luang Por Im was ordained way back in the year 2426 BE, and became a solitary Tudong Forest Wanderer Monk, who traveled thrroughout the country learning Wicha with many forest Masters along the way, until he came upon a place of great peacefulness and solitude, at the foot of the Hua Khao Mountain in Supanburi Province. he decided to remain and build a temple there, which he named as 'Wat Hua Khao' and remained there as its first Abbot. Luang Por Im was the Kroo Ba Ajarn of the great Luang Por Mui (Wat Don Rai), who spent one year with him at Wat Hua Khao, to learn the powerful Wicha Akom of this Great Supanburi Master Monk. Luang Por Im took Luang Por Mui to learn Wicha with the great Luang Phu Sukh, of Wat Pak Klong Makham Tao, who was a close friend and fellow sorceror monk with Luang Por Im. Luang Por Mui also traveled often on Tudong forest wandering with Luang Por Im as his apprentice, and is considered his first Looksit and inheritor of his Wicha Akom Sorcery, along with Luang Por Khaeg (Wat Hua Khao), Luang Por Pui (Wat Kho), and Luang Por Song (Wat Sala Din).